We’re back with more aerial photography coverage from Walt Disney World, but today’s post is extra special. 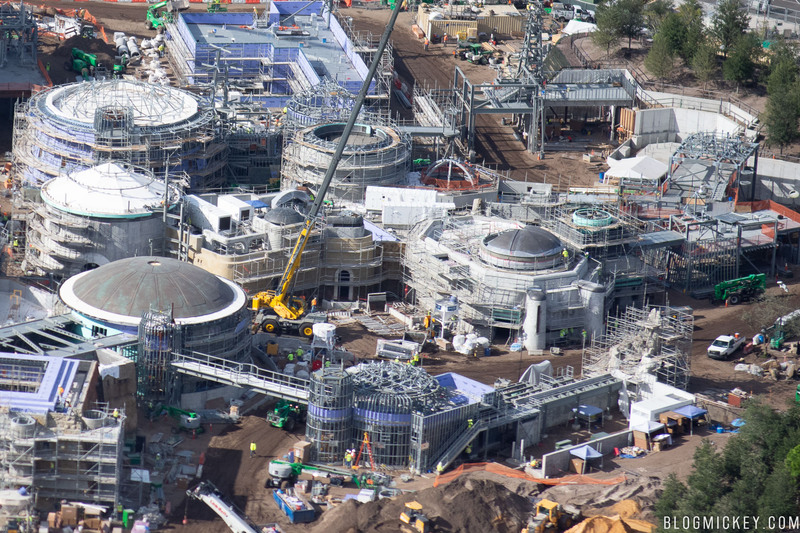 We had the opportunity to fly over the Star Wars: Galaxy’s Edge construction site with Wes from ReverseImagineering.com. Where our photos are limited in scope to their traditional two dimensional nature, Wes does something called photogrammetry, which is a very specialized way of photographing a scene that allows him to construct a 3D model of his scenes. 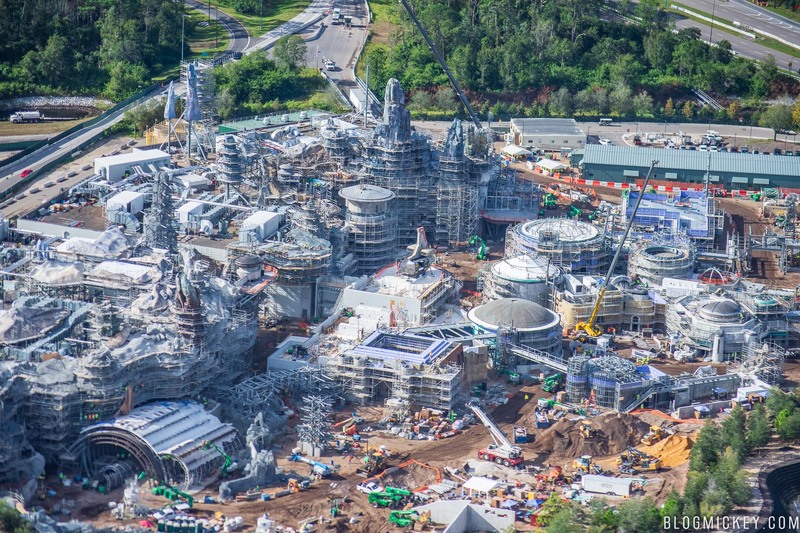 In this case, we flew a very calculated route around the Star Wars: Galaxy’s Edge construction site and what Wes created is nothing short of amazing. After playing around with the 3D model below, check out our detailed photos following it. We’d also like to encourage you to visit ReverseImagineering.com to check out more of the awesome work that Wes does! We’re going to try and go through the land as methodically as possible, hitting some of the interesting highlights. First, how will you enter the land? 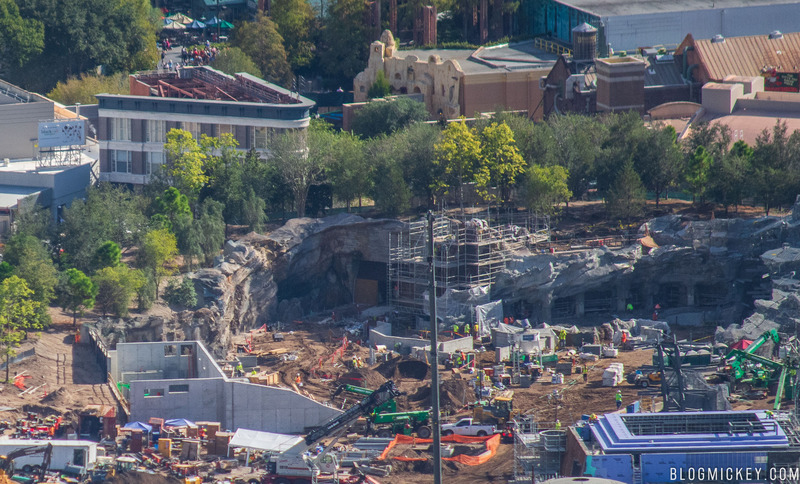 The popular theory at the moment is that Grand Avenue will serve as a massive queue and the main entrance into the land will be through the tunnel constructed over the last year or so. From the air, there are a few interesting elements that come into play when considering the area on the other side of the tunnel in the above photos. The below photo shows where the tunnel enters the land in the center of the photo. 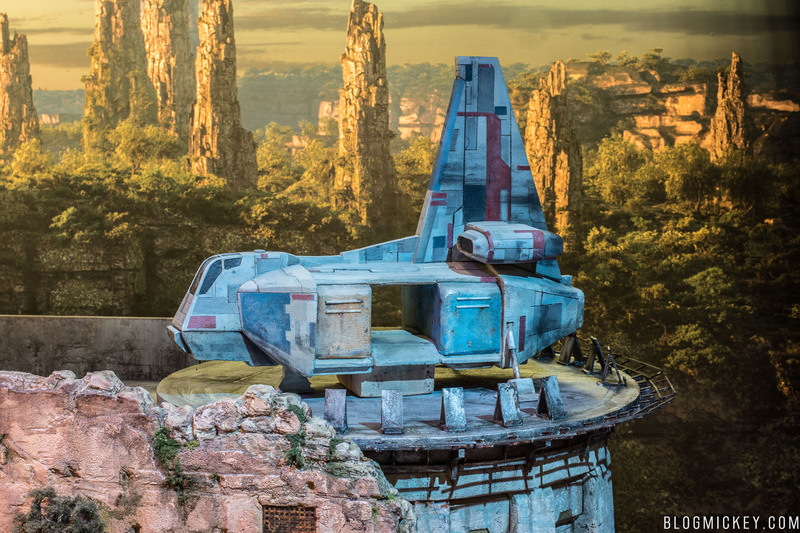 There will be a slight s-curve in the tunnel to make sure that the reveal presented to guests entering Batuu are truly wowed. Other interesting elements include what appear to be windows or openings on the right side of the image. Hollywood Studios differs from the Disneyland version in that we only have two points of entry/exit. 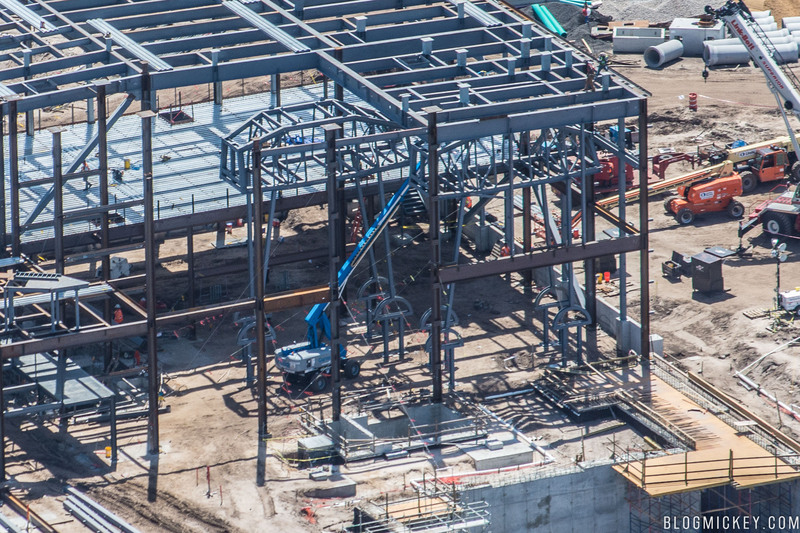 The Grand Avenue entrance was shown above, and the second will transport guests into Toy Story Land. 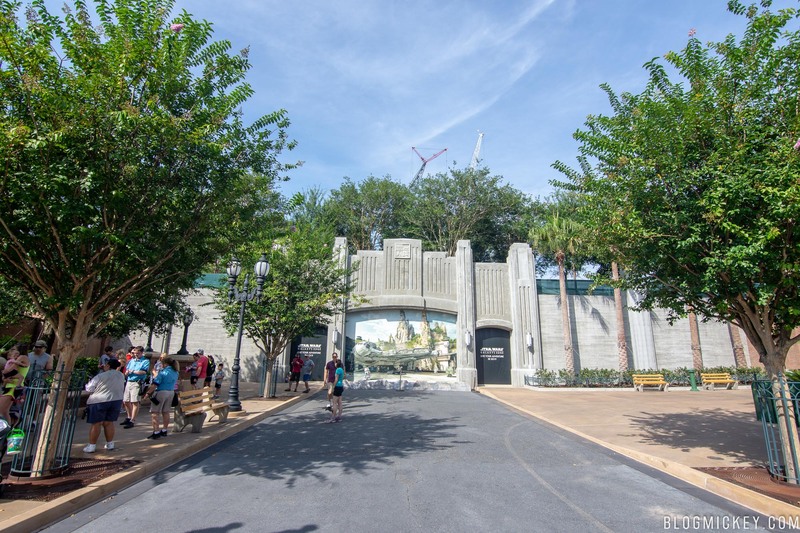 If the Grand Avenue point of entry does serve as the exclusive entrance, that means the Toy Story Land gateway will serve as the exclusive exit. 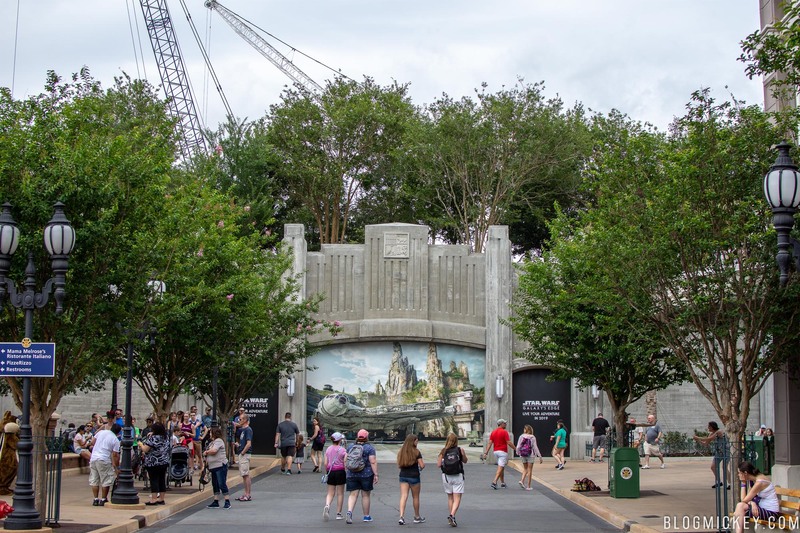 We saw a similar attempt at access control with the opening of Pandora – The World of Avatar last year at Disney’s Animal Kingdom. Here’s a look at the Toy Story Land point of entry from the ground and air. This aerial photo is basically a reverse angle of the above photo. We can see the back of the Toy Story Land gate in white through the trees. 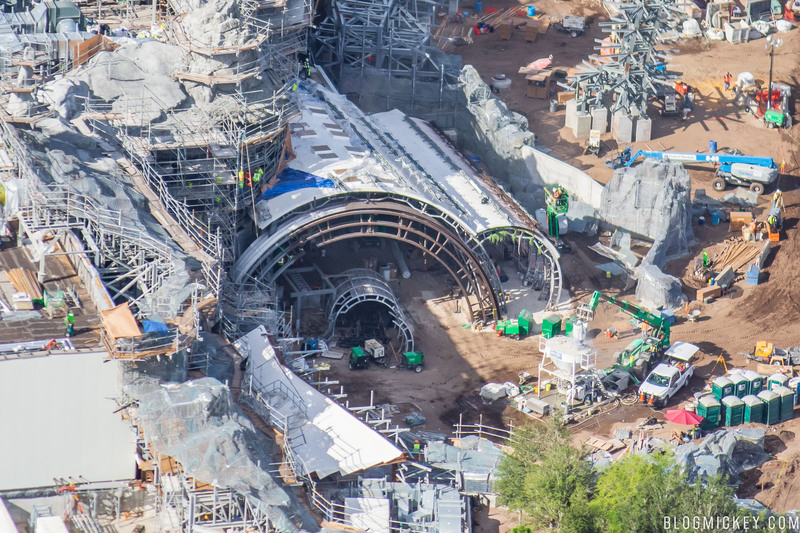 The path to Star Wars: Galaxy’s Edge snakes through a cutout between rock formations seen where the machinery and construction workers are in the photo below. Now that we have both entry/exit points covered, let’s take a look at what is supposed to be one of two headline attractions in the land, a trackless E-Ticket that has been referred to as Battle Escape. 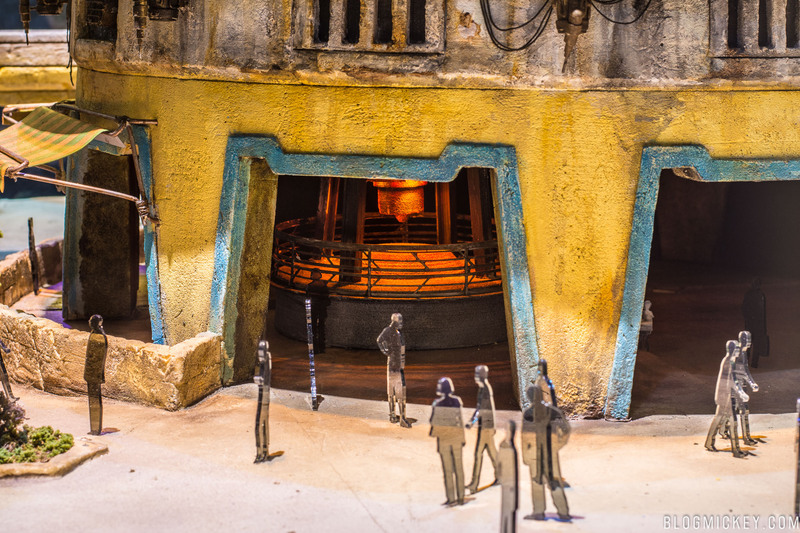 In this attraction, you’ll board a trackless ride vehicle that seats 8 guests. You’ll soon find yourself in the middle of an intense battle between the First Order and the Resistance. The building itself is massive. We know that it houses two full-size AT-ATs thanks to previous aerial photos and on-the-ground progress photos that we’ve taken in the past. 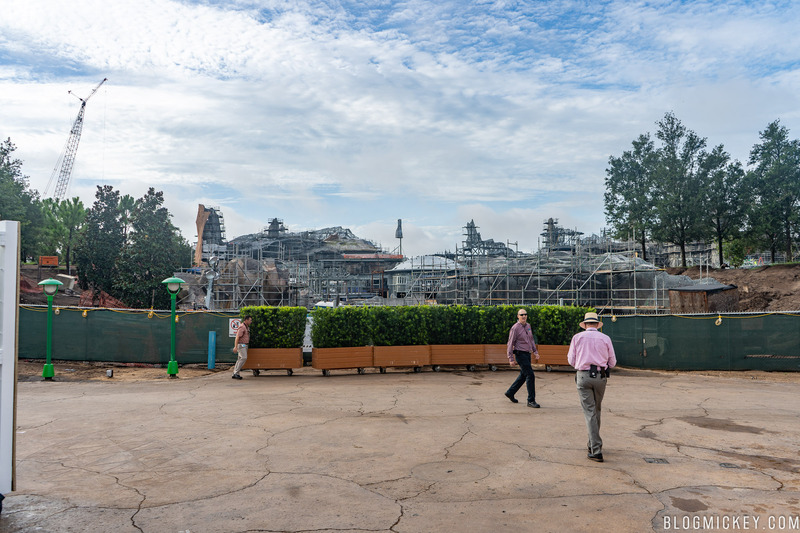 With all of that long-since enclosed by the show building, we’re left wondering how some of the exterior elements will work to immerse guests into the story. One such exterior element looks to be the ruins of a massive ship or building. 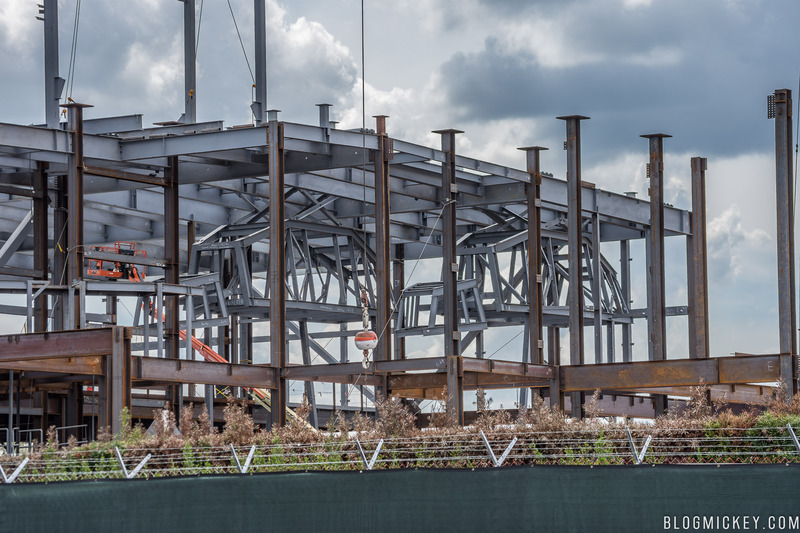 It’s a massive structural element and one that could very well serve as a focal point to drive guests to the Battle Escape attraction. We described this element as the “ruins” of a ship due to the worn-down nature of the structure. From this angle, we can see that the metal that once enclosed the structure has been torn open, or weathered down over the years to expose the steel skeleton of the structure. 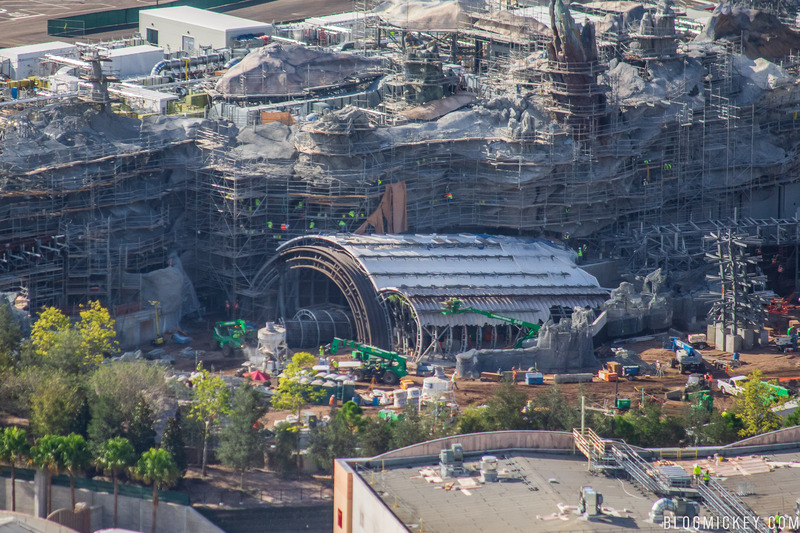 A closer look reveals that theming that looks like grass is hanging from the right side of the structure. Could nature be reclaiming a part of the structure like we’ve seen in various buildings and parts of Pandora – The World of Avatar? Another interesting choice seems to be the center ring as seen below. Could this be an underground entrance to the attraction? 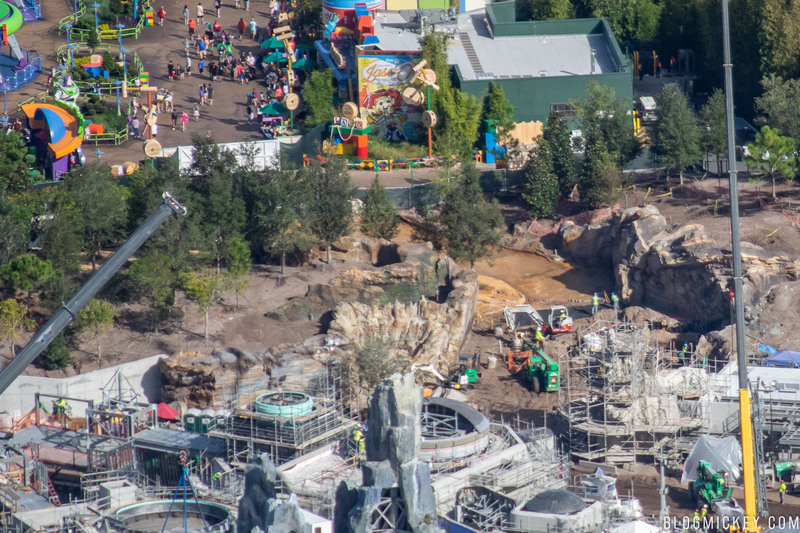 A more elevated view from the east side of Hollywood Studios looking back towards Star Wars: Galaxy’s Edge shows just how detailed the village of Black Spire Outpost really is. Here’s a similar angle from June 2017. Let’s take a closer look at some of the buildings of Black Spire Outpost. 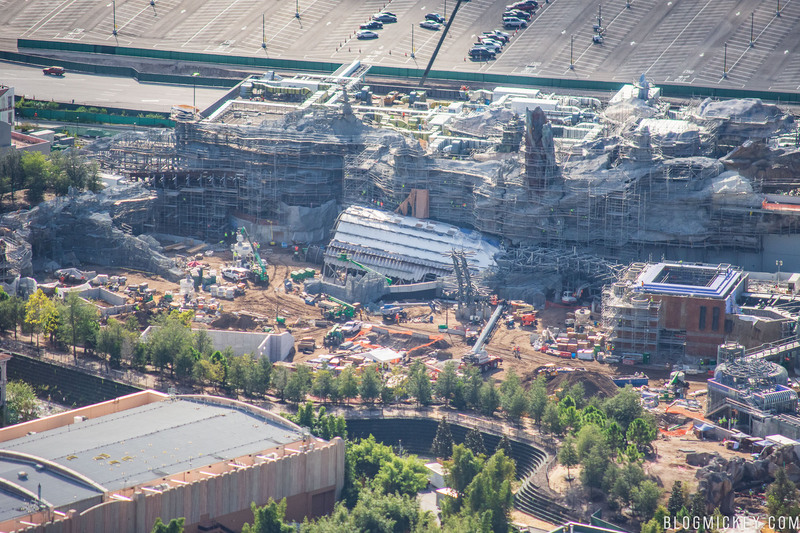 One of the more visible thematic elements from Black Spire Outpost has been a transport ship that can be seen atop the buildings of Galaxy’s Edge from Toy Story Land. 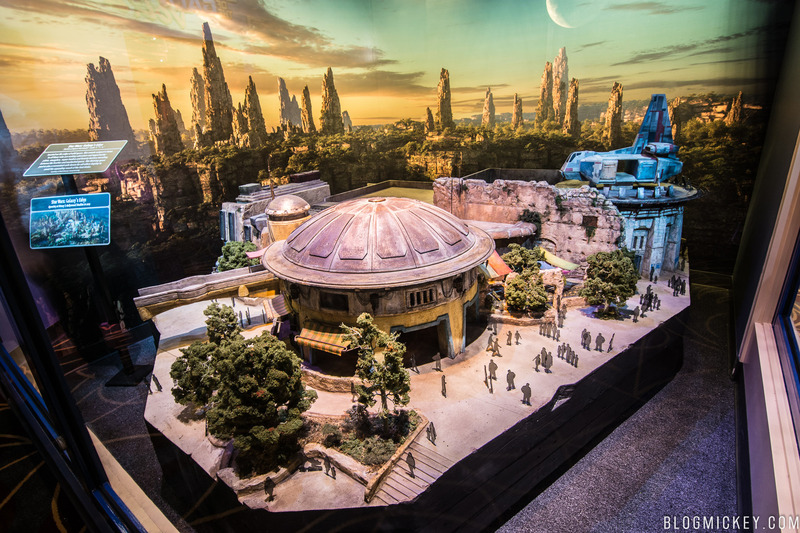 Of course, Disney might not need to build the whole ship depending on sightlines within the land. 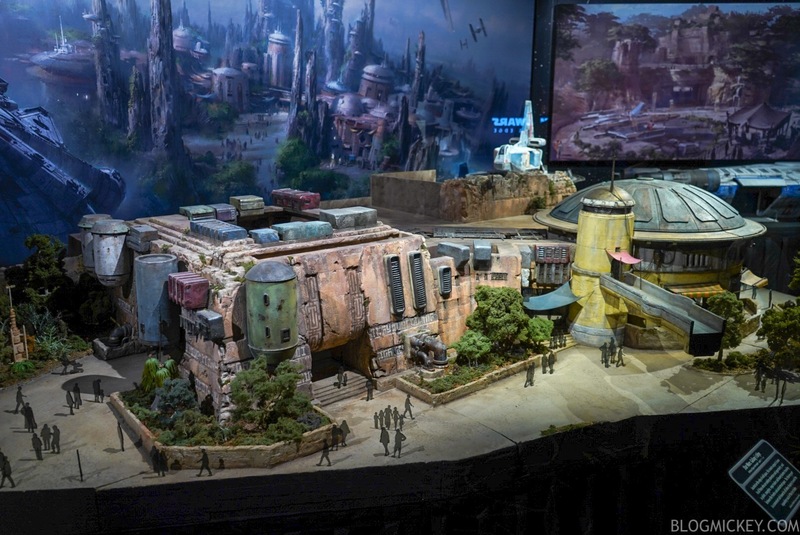 Here’s a look at the same ship from a section of the D23 Star Wars: Galaxy’s Edge model in Walt Disney Presents. Another large, open-roof building can be seen nearby. 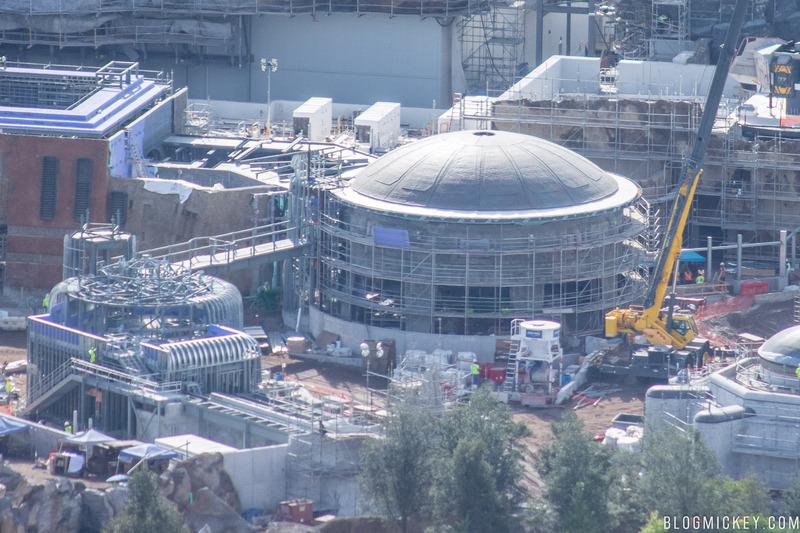 Painting has already begun on this building to make it look like the scale model on display at Walt Disney Presents. 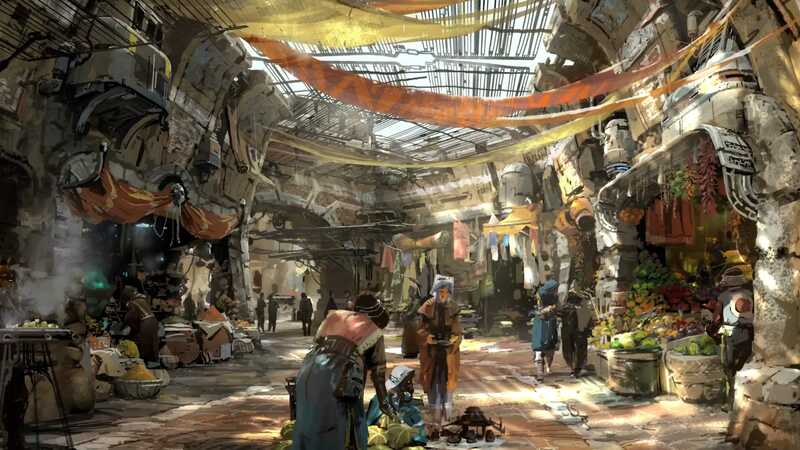 Another angle shows the same building with connecting outdoor market as seen in the following concept art. You can see the partially covered market in the aerial photo connecting the square shaped building and the building with the large, domed top. 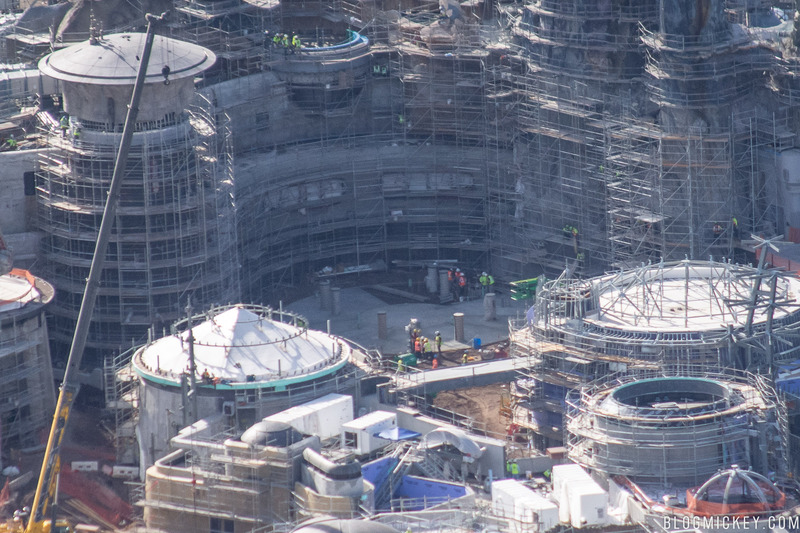 The circular building that is connected to the square one is actually an eatery, according to concept art and the Walt Disney Presents model. Seen in the model, it’s the eatery that features a podracer engine as the open flame that will be used to cook food in the land. Here, you can see the eatery on the left side of the concept art, along with a little bit of the transport ship behind the domed roof. 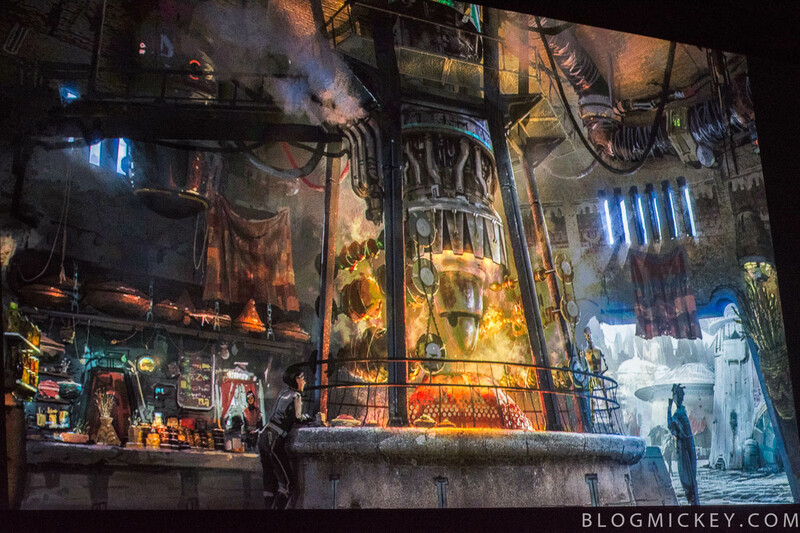 Here’s the inside of the eatery from concept art released at Star Wars Celebration. 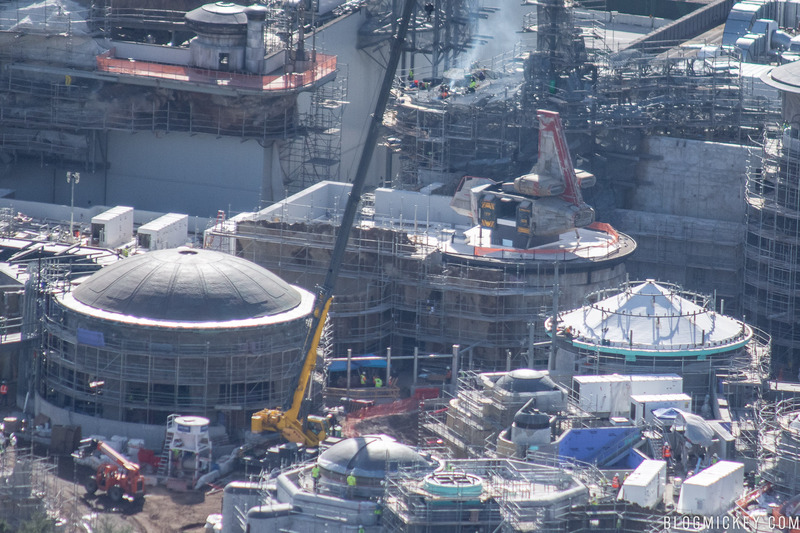 Here’s a look at that eatery from our recent helicopter flight over Galaxy’s Edge. Note the connecting marketplace alley coming from the back of the building to connect it to the nearby square building. 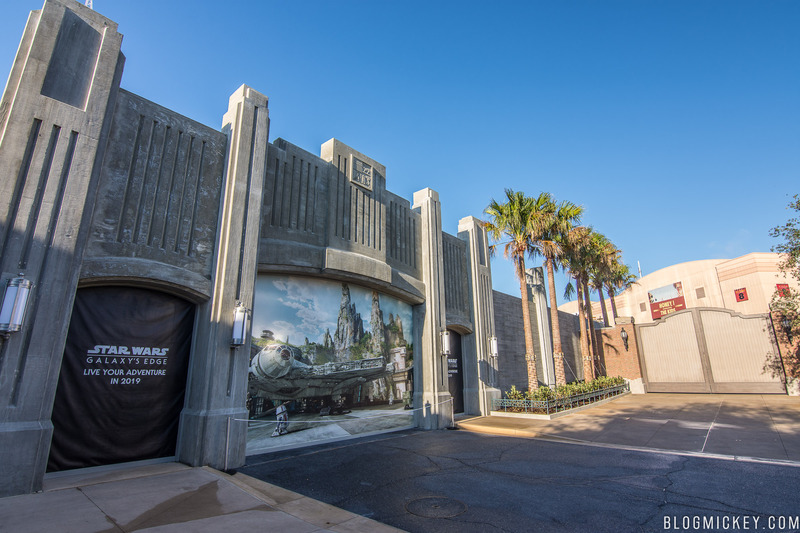 We’ve already talked about the Battle Escape attraction coming to the land, but as far as attractions in the land, we’d be wise to listen to Yoda when he says, “there is another”. The Millennium Falcon attraction has definitely received more press than the Battle Escape attraction, and for good reason. Parties of 6 will pile into the iconic “piece of junk” and pilot it through a variety of missions. 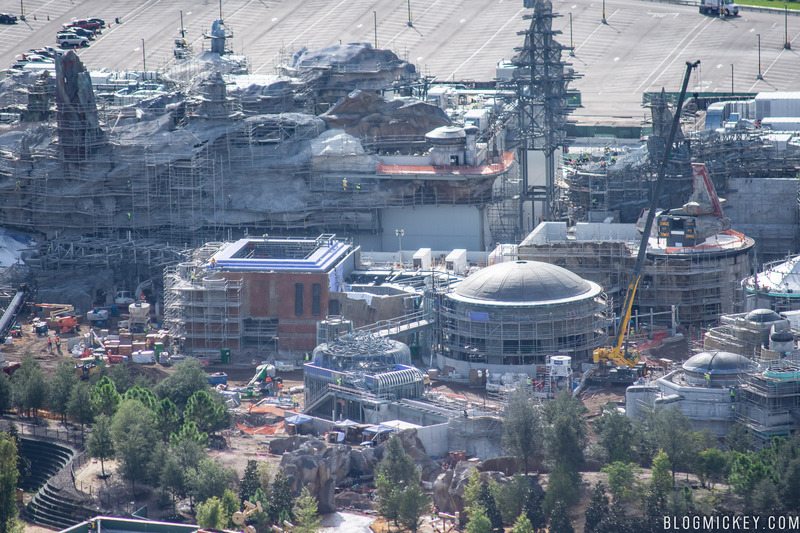 Thanks to recent aerial imagery from Disneyland, we know where exactly the fastest ship in the galaxy will be parked. 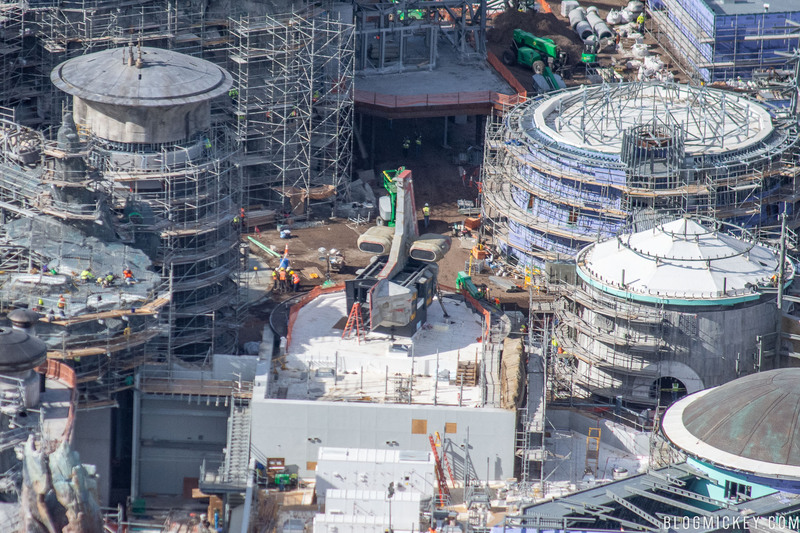 Unlike Disneyland, where you can actually see construction has started on the Millennium Falcon, only the supports for the ship can be seen here in Hollywood Studios. As far as theming is concerned elsewhere in the land, it seems like Disney is progressing nicely, with exterior paint and theming applied to buildings nearby the eatery. 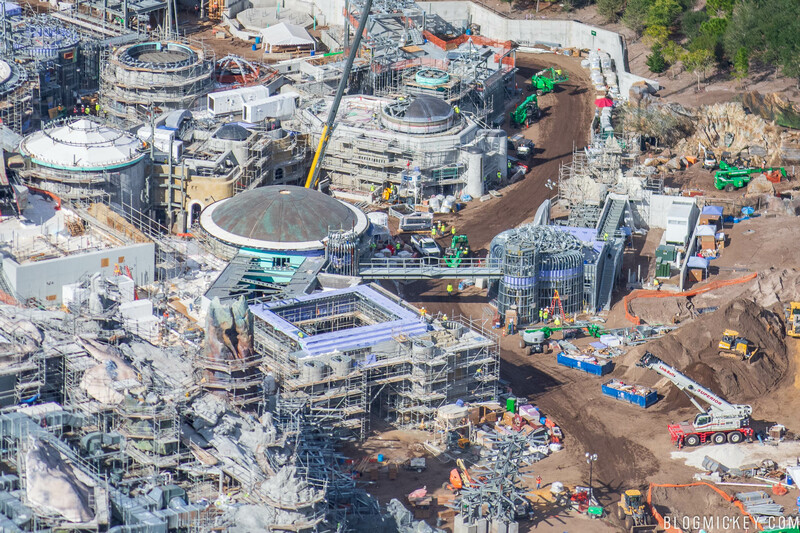 Finally, we’d like to give you a really wide, overview of how Star Wars: Galaxy’s Edge fits into the rest of Disney’s Hollywood Studios. 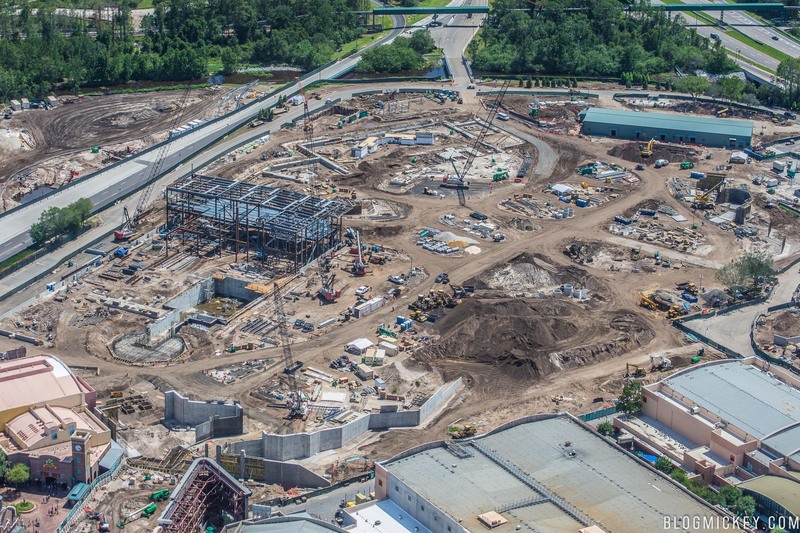 At 14 acres, Star Wars: Galaxy’s Edge will dominate the southwest corner of Disney’s Hollywood Studios for decades to come. 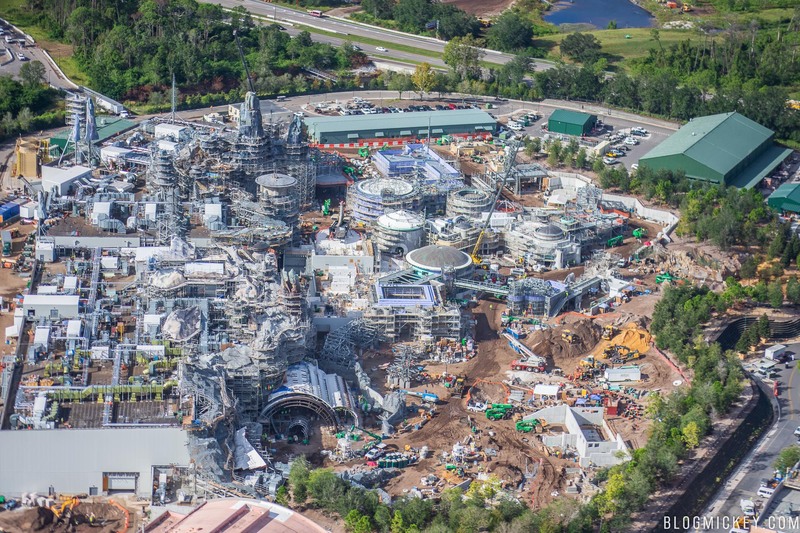 Here’s a wider look at the park, along with the expanded parking lot. 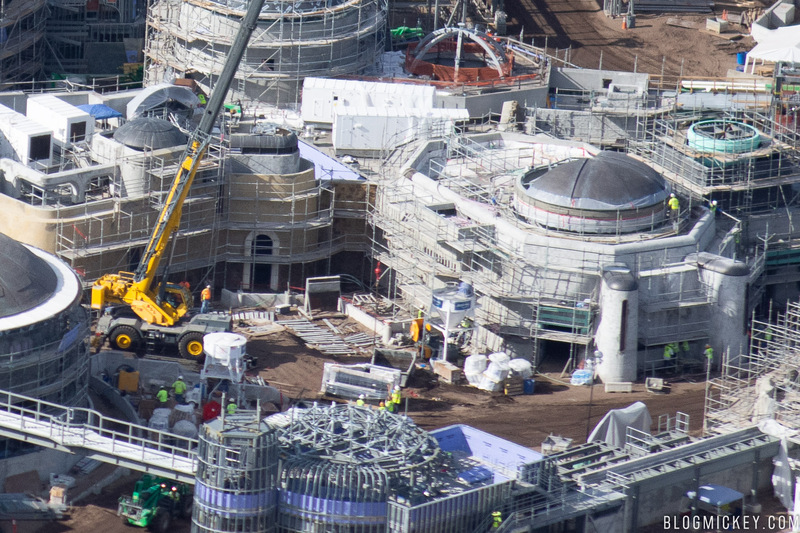 Star Wars: Galaxy’s Edge is currently scheduled to open in late-Fall 2019 at Disney’s Hollywood Studios. 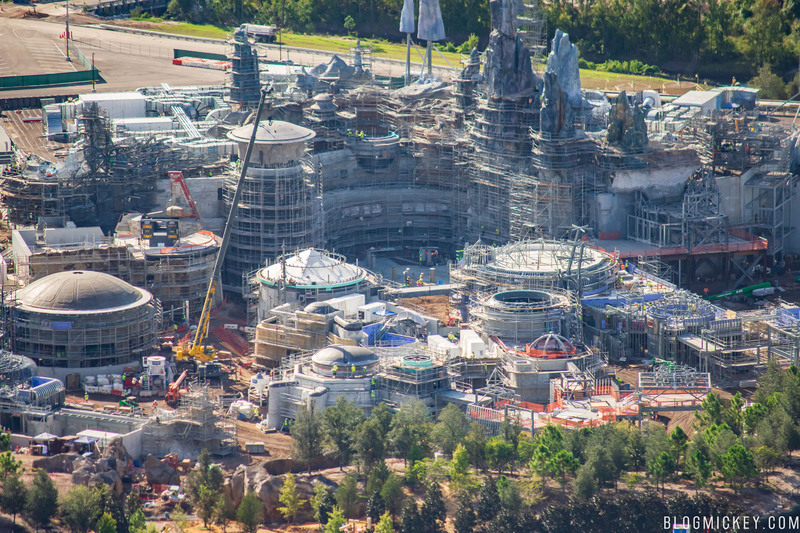 As always, keep checking back with us for the best looks at this and many other Walt Disney World projects, updates, and reviews.